We live in a tumultuous time. Upheavals and reversals in culture, popular opinion, morality, race relations, socioeconomic status, and so much more have entire generations feeling off balance or out of touch. How do we keep pace with the breathtaking rate of change in our society when we can hardly find time to keep up with our racing newsfeeds? And in the face of such enormous cultural forces, is there anything we can do to help shape our culture? 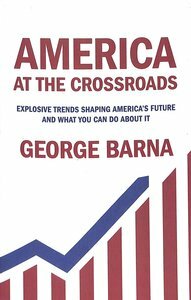 With America at the Crossroads, bestselling author and cultural analyst George Barna turns his researcher's eye on the most significant trends of our moment in history, compiling and distilling the most salient information for busy readers who want to shape culture rather than allow it to shape them. Anyone who has felt overwhelmed by our swiftly changing times will appreciate Barna's extensive research and his "bottom line" approach. About "America At the Crossroads: Explosive Trends Shaping America's Future and What You Can Do About It"
George Barna received a doctorate from Dallas Baptist University, worked in the Massachusetts state legislature and as a pollster and a campaign manager. George and his wife, Nancy, founded the Barna Research Group in 1984. In 2004, he re-engineered the for-profit corporation into The Barna Group, of which he is the Directing Leader. The firm analyzes American culture and creates resources and experiences designed to facilitate moral and spiritual transformation.Located in Ventura, California, The Barna Group provides primary research (through its Barna Research Group division); musical, visual and digital media (through BarnaFilms); printed resources (BarnaBooks); spiritual and leadership development for young people (The Josiah Corps); and church enhancement (Transformational Church Network). To date, Barna has written 39 books, including best sellers such as Revolution, Transforming Children into Spiritual Champions, The Frog in the Kettle, and The Power of Vision. His most recent books include Revolutionary Parenting and Pagan Christianity? The Barna Research division has served several hundred parachurch ministries and thousands of Christian churches throughout the country. It has conducted research for numerous parachurch organizations, such as the Billy Graham Evangelistic Association; World Vision; American Bible Society; Campus Crusade for Christ; Thomas Nelson Publishers; Zondervan; and Tyndale House Publishers.